From ROG: A few months ago, Aron Nelson released the Smash Drive. The circuit ingeniously used an LM386 audio power amp chip to produce great distortion sounds. Aron based his work on that of Tim Escobedo. Tim's Stupidity Box was another great sounding unit and beautifully simplistic. The Smokey Amp by Bruce Zinky was another design that used a 386 for some great sounds. I'm super-excited about seeing more ROG layouts on here. I'm a n00b electronics guy wanting to find a slightly easier way to figure out the circuits other than screwing them up on a perfboard 20 times. yea, a breadboard would be a good idea too. I'm hoping either of you will get bored enough to make a run at the Dr. Tweed and the Azabache. Thanks for doin what you do-do-do! Thanks for your words. I'll be looking at those both at some point. I'm loving the low parts count layouts! Would it be possible to tag them so that in between part orders...i can see if I have enough spares around to build one? you can tag this one. verified. another quick and easy build. it sounds pretty good as well. i tried it with a few different J201's and they all sounded pretty good, even some questionable ones i got from a seller in china.i am also loving the low parts count builds. you can get a few done in no time at all. 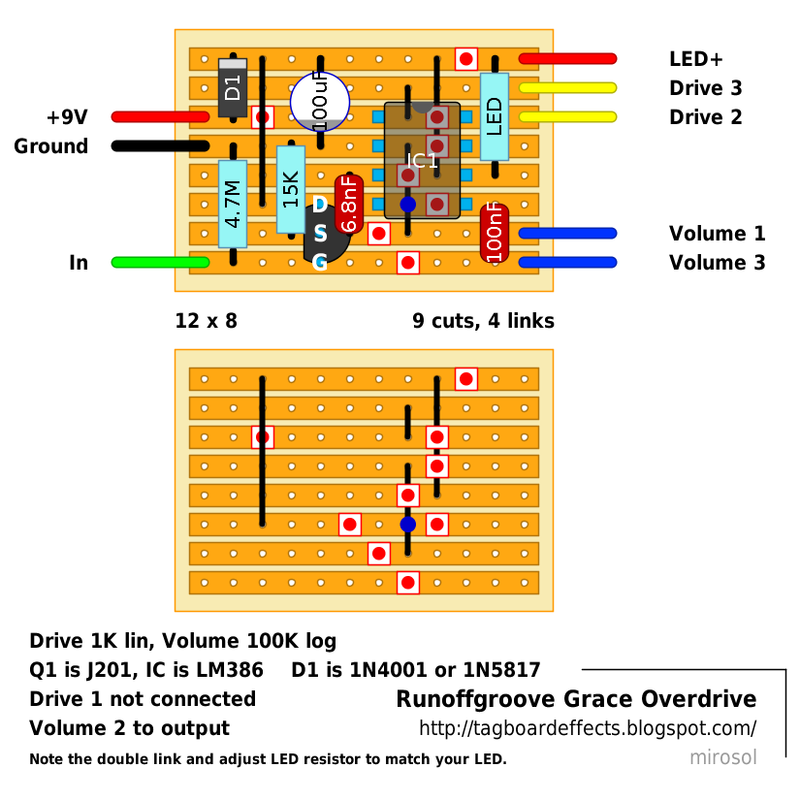 also, i know you're not really taking requests, but a low parts layout i wouldn't mind seeing is the lovepedal woodrow. Great to see someone else lost it for builds too :) Definitely one of the best hobbies i've ever had. Mark- i don't think there could be a miro2! i remember not to long ago when he was building them as fast as you were posting them! didnt he build every big muff variant in a single day? i think he built the green russian in the time it took my iron to get hot! i've just had some free time lately, and you guys have posted some good ones that are quick and easy. Miro- i agree 100% . i've never had a hobby that my wife hated more!! I really like the sound of this - what does the 6.8N cap do? I used a 4.7 that I had on hand. Should I have gone to a higher value as opposed to lower? And I assumed the D1 was a protection diode so I used a 1n4001, is that correct? Diode is in fact a polarity protection (i'll add a label..). That 6n8 is the input cap from buffer to IC. 4n7 will work just fine, but you should use larger value, if you want bigger bass responce. I built this as my first foray into veroboard, after building a few kits with conventional circuit boards. By following the build guide I was able to put it together from scratch in about an hour. Would you consider including a bill-of-materials with your layouts? It's quite a bright sounding overdrive with a relatively low amount of drive available. I'm currently using a no-suffix LM386. Has anyone tried different chips and what did they find? Volume pot's lug number 2 - take a wire and solder it to the that. Other end of that wire is your output. maybe im blind but idont see vol2. You don't see the two volume connections shown on the board, or the other one mentioned in the notes? You have your volume pot. It has three (3) lugs. Lug 1 connects to the board where it says "Volume 1". Lug 3 connects to the board where it says "Volume 3". The middle lug, lug number 2 - You take a wire and solder that wire to this lug. Now, the other end of this wire is the output. You connect this end of this wire to your bypass switch. So. 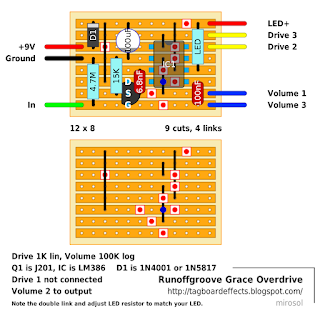 The output is not coming off the board itself, but from volume pot's lug number 2. It says "Volume 2 to output" on the layout. This means just that. Volume 2 (the lug number two) is the output of this effect circuit. It does not connect to the board. Just built a version of this and I accidentally connected the output of the buffer to pin 2 (the inverting input) and grounded pin 3. It works and sounds like I would expect. What differences would I anticipate if the output of the buffer went to pin 3 instead? I also used a J202 for the buffer and the thing sounds pretty mean. Getting a little radio interference, but could be a shielding issue.